Every electrical and electronic appliance is designed to work perfectly at a certain input voltage. In Nigeria, household electrical and electronic appliances are designed to work properly at 220VAC, 50Hz and most of the times the voltage supplied from distribution companies are as low as 80VAC making this appliances to work under threat of low voltage supply. This low supply voltage causes these appliances to malfunction and in most cases damage them. Since the electric power supply/distribution companies are unable to provide the consistent adequate voltage level (220VAC) demanded by these sensitive appliances, therefore there is need for consumers to protect the appliances from damage and ensure their safe operation, hence the use of automatic voltage stabilizers to improve the situation. In this research work, a PIC16F877A microcontroller was programmed to monitor the input voltage from distribution companies and if voltage level is between 80 VAC and 250VAC, it gives a constant output voltage of 220VAC (±6%) required by the appliance. In doing this, it constantly varies the turn's ratio of the Auto-transformer, initiating a step-up or step-down operation of the transformer so that a regulated voltage of 220 VAC (±6%)is obtained at the stabilizer output. The design also includes an under/over voltage device protection which ensure that the device is inoperative when the supply voltage is above 250VAC. The system constructed was tested with a variable transformer. At voltages within the specific input voltage range, the stabilizer gave an output voltage of 220 VAC (±6%) and voltages outside the specified input range, the over/under voltage protection prevents power from being supplied to the auto-transformer thus making the stabilizer output to be 0 V. The system at this voltage alerts the user of the anomaly by displaying UNUSUAL VOLTAGE on the LCD Screen.
. Akinlolu, A. P. "Performance of Domestic AC Voltage Stabilizers in Meeting Low Voltage Problems in Nigeria: A Case Study of 12 Different Brands" International Journal of Engineering and Technology Volume 5 No. 6, June, 2015. Visual impairment is one of the biggest limitation for humanity, especially in this day and age when information is communicated a lot by text messages (electronic and paper based) rather than voice. The device we have proposed aims to help people with visual impairment. In this project, we developed a device that converts an image's text to speech. The basic framework is an embedded system that captures an image, extracts only the region of interest (i.e. region of the image that contains text) and converts that text to speech. It is implemented using a Raspberry Pi and a Raspberry Pi camera. The captured image undergoes a series of image pre-processing steps to locate only that part of the image that contains the text and removes the background. Two tools are used convert the new image (which contains only the text) to speech. They are OCR (Optical Character Recognition) software and TTS (Text-to-Speech) engines. The audio output is heard through the raspberry pi's audio jack using speakers or earphones.
. D.Velmurugan, M.S.Sonam, S.Umamaheswari, S.Parthasarathy, K.R.Arun. A Smart Reader for Visually Impaired People Using Raspberry PI. 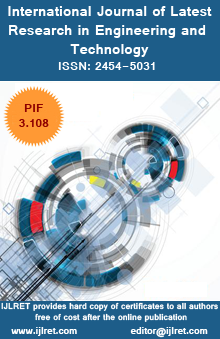 International Journal of Engineering Science and Computing IJESC Volume 6 Issue No. 3.
. K Nirmala Kumari, Meghana Reddy J . Image Text to Speech Conversion Using OCR Technique in Raspberry Pi. International Journal of Advanced Research in Electrical, Electronics and Instrumentation Engineering Vol. 5, Issue 5, May 2016.
. Silvio Ferreira, C´eline Thillou, Bernard Gosselin. From Picture to Speech: An Innovative Application for Embedded Environment. Faculté Polytechnique de Mons, Laboratoire de Théorie des Circuits et Traitement du Signal Bˆatiment Multitel - Initialis, 1, avenue Copernic, 7000, Mons, Belgium.
. Nagaraja L, Nagarjun R S, Nishanth M Anand, Nithin D, Veena S Murthy . Vision based Text Recognition using Raspberry Pi. International Journal of Computer Applications (0975 – 8887) National Conference on Power Systems & Industrial Automation.
. Poonam S. Shetake, S. A. Patil, P. M. Jadhav  Review of text to speech conversion methods. The purpose of this study is to evaluate the potential capacities and limitations on using multi-mission ultra-long duration stratosphere platforms. Stratosphere flight provides a unique vantage point for scientific exploration as well as for Earth observation and surveillance. The ability to fly for an extended duration of time several months to years) at near space altitudes is an elusive goal. However, in recent years. Renewable energy technology has progressed to the point where ultra-long duration multi-mission stratosphere platforms can be considered. This platform is one type of long endurance air vehicle that has significant potential. The proposed platform, unlike aircraft, generate lift through the buoyancy effect instead of through aerodynamics lift. So, such platforms do not need to stay in motion to remain aloft; it also has the ability to carry heavy payloads with considerable volume constraints. These characteristics, compared to other conventional conditions make it unique candidate for long endurance high altitude flight. The analysis shows high investment potentials and huge capacities in stratosphere flights. It also proves that building such platforms is feasible and promising. Also, it may help the third world countries in growing and sustaining their development plans. Owen D., "Lighter Than Air: An Illustrated History of the Development of Hot-Air Balloons and Airships", Edison, New Jersey: Chartwell Books, 1999. Khour G.A., and Gillett J.D., "Airship Technology", Cambridge Aerospace Series 10, Cambridge University Press, Cambridge, England, UK, 1999. Grimmelt J., "Floating Concrete Unite-Lighter than Air Opportunities of the new Cargo Lifter Technology", Concrete Pre-casting Plant and Technology, 68(2): 88-9, 2002. Mayer N., "Lighter Than Air System", Aerospace America, Aircraft and Air Transportation Systems, December 2007. Colozza, A.J., ―High Altitude Towed Glider, NASA CR–198493, June 1996.